Earlier this year we were able to publish more of our images online with a new platform, as we continue to test our workflow. Please come and take a look at this latest collection on Shared Shelf Commons. So far this collection includes 65 pages of Mourning Dress images and text from the research notebooks of costume historian Nancy Rexford. Pages include xeroxes of illustrations and texts from 19th century primary sources (primarily fashion periodicals), annotated with the date and source of each image, and organized both by type and chronology. We prioritized our work on this particular notebook section so that it could be used for a course at Smith College with a focus on mourning as represented in literature. Many thanks to Smith student Li-Li Wu for her hard work to catalog these images in time to share them with this class (in which she was also a student). This work in Shared Shelf was made possible thanks to our Digital Humanities Award from Artstor. 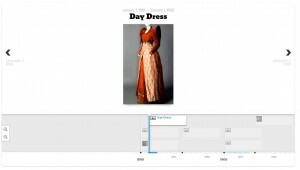 The work of HistoricDress.org and the team members helping to develop it is highlighted in an article in the 2nd 2015 issue of DRESS, the journal of the Costume Society of America. This can now be viewed online (as of January 2016). This article is not yet available as an open access article, but can be viewed by members of the Costume Society of America, as well as through libraries that subscribe to T&F databases. Please contact us, or your local librarian, for help in gaining access to this article. At our latest prototype in Omeka, at http://historicdress.org/omeka2/, you can go through some of Nancy Rexford’s research notebooks page by page and see multiple views of some shawls from Nancy’s research. It’s a work in progress, but we’d love your feedback! We’ve Won an Artstor Digital Humanities Award! We’re very proud to announce that Historic Dress has won an award from Artstor! We’re one of three Digital Humanities projects provided with a five year subscription to their Shared Shelf digital media management system. You can read more about these awards at https://artstor.wordpress.com/2015/02/11/announcing-the-artstor-digital-humanities-awards-winners/. Shared Shelf will provide us with a platform for collaboration, growing our project to include additional contributors. Earlier phases of this project were based at Smith College and UMass Amherst, funded by a series of grants from the Mellon Foundation to support Digital Humanities initiatives at the Five Colleges in Massachusetts. We explored ways of building upon existing standards to create a robust online environment specific to the study of historic clothing. 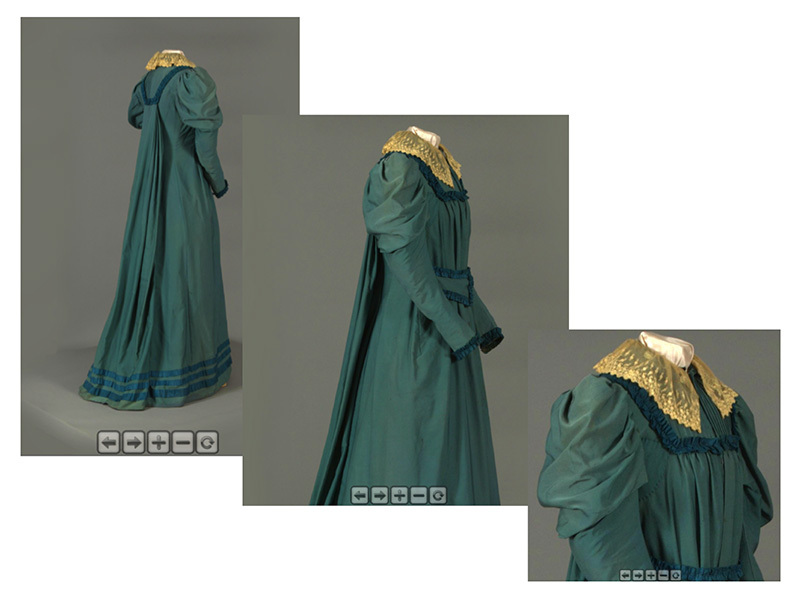 Digitizing materials from the personal research archive of costume historian Nancy Rexford and from the collection of historic clothing at Smith College, we identified the special needs for metadata creation and web development that would support our goals. We began to develop CostumeCore, which builds upon the VRACore metadata schema to add elements specific to the study of historic clothing. Shared Shelf’s specialized tools for developing customized metadata elements and controlled vocabularies will help us greatly to continue to develop CostumeCore and to test it with contributors from other institutions. We will continue to develop our Omeka site, integrated with Shared Shelf through the plugin they have developed. Close up of a shawl from Historic Northampton. 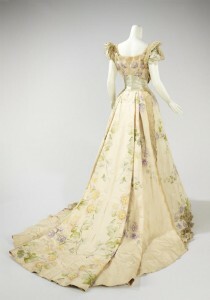 Photograph by Nancy Rexford; digitized in the first phase of the HistoricDress project. The initial working group for HistoricDress includes Kiki Smith, Elisa Lanzi, Marla Miller, Nancy Rexford, Arden Kirkland, Tom Scheinfeldt, and Jon Berndt-Olsen. We are now joined by Kathi Martin from Drexel University and Gayle Strege from The Ohio State University. Throughout this project we have received additional support from librarians, archivists, curators, faculty, technologists, and researchers from Smith, UMass Amherst, Mount Holyoke, Amherst, Hampshire, Vassar, Drexel, Ohio State, UConn, Historic Deerfield, and Historic Northampton. We continue to seek participation from an ever-growing group. Artifacts from the collections of Smith and Vassar Colleges, Drexel University, and The Ohio State University will initially be included, with the potential to add more participants. Artifacts from numerous collections across the country will also be represented via the documentation of costume historian Nancy Rexford. Her personal research archive serves as an impressive finding aid to original objects in small “hidden” collections not otherwise accessible online. We are very pleased to share this content with the Artstor community. Also, Artstor will help move our content upstream to the Digital Public Library of America (DPLA). The media that will come together in Shared Shelf will include images of garments from multiple angles with close-ups and interior views to show construction, microscopic images of fibers, objectVRs, analytical videos, and oral history audio files and transcripts. 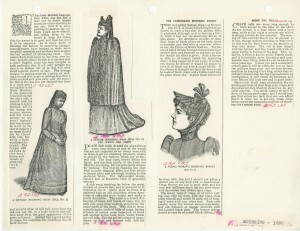 Rexford’s research archive also adds numerous annotated fashion illustrations from historic periodicals, sorted by object type and chronology, with original source citations. This interplay of diverse media from multiple institutions will provide a unique opportunity to scholars and students. We’re very excited to get started on our next phase, and very grateful to Artstor for providing this award! Today we are happy and excited to present a guest post from Noelle Reilly, a senior at St. Lawrence University in Canton, New York, studying History and Anthropology. Noelle was a student this summer in the Historic Deerfield Summer Fellowship Program, where she took on a research project involving shawls in the collection. Here she reflects on her encounter with this distinct form of material culture. I didn’t think I would be studying shawls. As a Historic Deerfield Summer Fellow, it was my task to come up with a promising research topic for the summer of 2014. I struggled with indecision, too interested in anything and everything to possibly narrow it down. 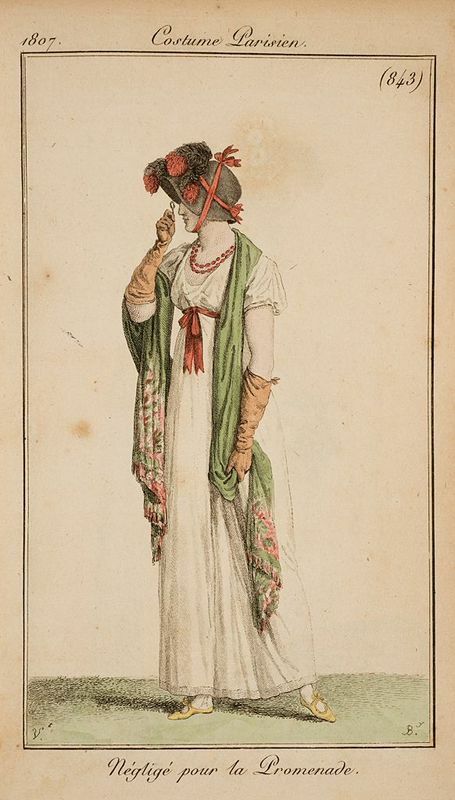 After a lot of intense deliberation and help from my faculty and peers, I finally decided to focus on a recently acquired collection of 1807 French fashion plates in the Historic Deerfield collection. 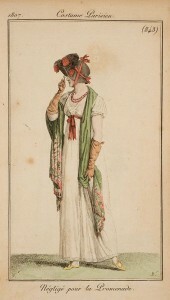 A large number of these plates depicted beautiful cashmere shawls. I thought it would be interesting to research the adoption of shawls as a fashion accessory and to compare their functions in Europe with their functions in the young United States. Courtesy of the Henry N. Flynt Library, Historic Deerfield. My research involved a delightful combination of textual sources and material culture. To understand the rise of shawls’ popularity, I read books on textiles history and the rise of the Empire Style in Western world. To understand more about shawl commerce in the Connecticut River Valley area, I browsed through decades of newspapers and the account books of local merchants. In the collections at Historic Deerfield and the Memorial Hall Museum of the Pocumtuck Valley Memorial Association I was able to view authentic cashmere and imitation cashmere shawls from the early 19th century. In examining this variety of sources, I learned that the same object can have different meanings and serve different functions among various cultures and peoples. In one region, a shawl might be viewed as an object of beauty and seduction, and in another, as a tool of modesty and practicality. Courtesy of Historic Deerfield, Hall and Kate Peterson Fund for Minor Antiques, 2013.22. Throughout this project I was not limited to studying only the fashion developments of the early 19th century. 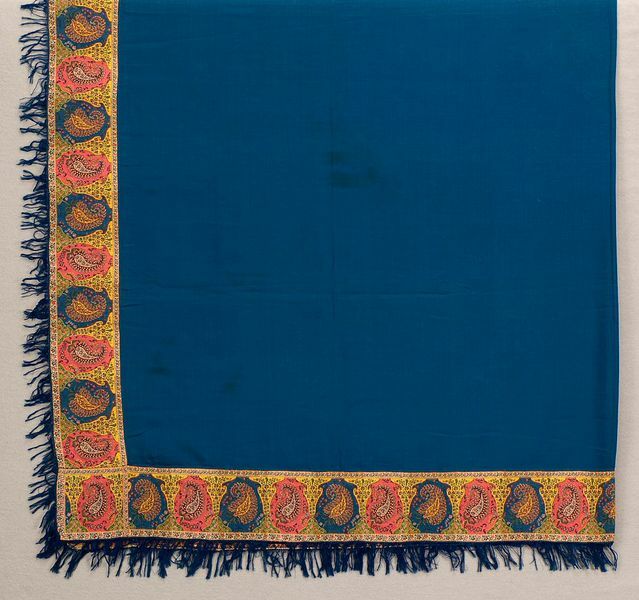 Researching the history of a single item—the shawl—allowed me to explore numerous facets of the 19th century world, including production methods, economies, international commerce, technology, animal husbandry, and cultural interactions. Shawls led me on a historical journey that I had not expected. The journey began in northern India, in the province of Kashmir, where the original shawls were woven as cultural garments. As shawls’ popularity boomed in Europe and the United States in the early 1800s, imitation production centers sprang up in the United Kingdom and France to meet demand. The journey of cashmere shawls continues today. Imitation cashmere still provides a cost-effective alternative to the luxurious and often costly fiber. The choices we face when buying scarves or shawls today are extensions of the same consumer culture that has blossomed over the past several hundred years. The choices we face with our clothing involve both financial and cultural factors. One realization I had during my research was that there is often more to what people wear than simply looking good or staying warm. In the case of the shawl during the Empire period, they were most certainly convenient for covering women’s newly bared arms and shoulders, but beyond that, a draped shawl conjured thoughts of Neoclassicism and democracy in the wake of the French Revolution. In other words, peoples and cultures create meaning for their clothes in a way that transcends functionality. This summer I learned that the history of clothing can be as rich and exciting as the history of politics or war. As cultures make collective decisions about what clothing means, individuals make the choice to stand by these meanings and display them in their own lives. Clothing can hide, accentuate, expose, and deceive. In cultures of conformity, sometimes making a bold choice about personal clothing and adornment can be as brave as taking a radical political stance. One of the easiest ways to express oneself is also one of the easiest ways to stand out and to receive criticism. Indeed, many American women were taunted for their adoption of the light, revealing dresses of the Empire Style in the early 19th century. And yet, trends catch on; people do impractical things to nurture a value or meaning that they themselves have created. It makes me wonder about today’s world and the choices we make with our clothes. As I sit here writing this, the shirt I am wearing could be making a cultural or political statement. But do the clothing choices I make reflect an inner value system that is uniquely my own or one that is fully imposed by the culture that I have grown up in? This might be a question that I cannot answer myself. It might just take a future historian to consider all of the influential factors that shape our modern perception of fashion to decode and deconstruct the meanings we clothe ourselves in. John Irwin, The Kashmir Shawl (London: Her Majesty’s Stationary Office, 1973), 4-5; Aileen Ribeiro, The Art of Dress: Fashion in England and France 1750-1820 (New Haven: Yale University Press, 1995) 125. Phyllis G. Tortora and Keith Eubank, Survey of Historic Costume: A History of Western Dress (New York: Fairchild Publications, Inc., 1989), 265. A recent trip to Scotland gave me a chance to add dimension to what I’ve already learned from the Historic Dress project’s exploration of shawls. An invitation to a conference in Glasgow (on early modern women and work) provided the chance to do some touring around, and to prepare for the trip I wanted to learn more about Scotland’s textile industry. For obvious reasons I started by reading about the history of tartans, and visits to the National Museum of Scotland as well as a variety of castles and other sites afforded opportunities to see portraits and other paintings that plot the history of this iconic fabric. Another textile-related highlight was seeing the Great Tapestry of Scotland–a truly spectacular effort in conception, design and execution, as the dozens of photos I snapped will attest! Though I was sorry not to be able to get to New Lanark (which I heard great things about from other travelers), the Islay Woolen Mill, where we could see (and hear) the machinery in operation, was a highlight there. 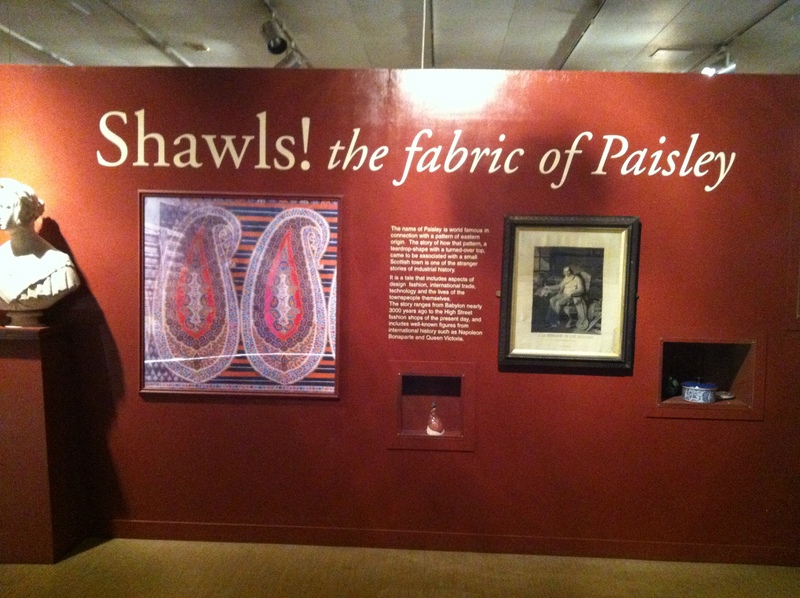 But given this project’s focus on shawls, it was exciting to find Paisley included on the Scottish Textile Trail. Located very near the Glasgow airport, it was an easy stop to make. Most travelers probably head to Paisley to see the beautiful Paisley Abbey, but I was happy to get to walk the streets and try to contemplate the setting behind the shawls we investigated as part of our project, and to imagine the men and women behind their making. Driving into the city center, which is just 20 minutes on the M8 west of Glasgow, street signs mark Cotton, Thread and Gauze Streets, placenames that signal the city’s distinctive history. The Paisley Museum and Art Gallery contains a permanent exhibit, “Shawls! the fabric of Paisley.” Exhibits interpret the history of shawl production globally, and particularly in Paisley, explaining that while Paisley was neither the first nor the only city to manufacture shawls, it did so on such a large scale that shawls with the boteh or buta motif became synonymous with the town. The exhibit begins by explain the Persian origins of the distinctive droplet-shaped design element, which crept into British visual culture beginning in the seventeenth century via fabrics imported from British India, and particular the region of Kashmir, at that time referring to the valley between the Great Himalayas and the Pir Panjal mountain range. 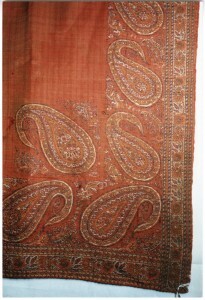 In the eighteenth century, Paisley became a major manufacturing center of shawls incorporating this design, and in the first half of the nineteenth century, the town was a leading producer of both loom-woven and printed shawls, the latter lowering the price point and making shawls accessible to a broader swath of the public. The site also became a center of thread production. The surprisingly modest number of shawls on display is nevertheless enough to allow visitors to appreciate the evolution of shawl design over the eighteenth and nineteenth century, from the long rectangular textiles of the neoclassical era to the triangular shapes of the 1820s and 30s, when shawls 6′ square were folded diagonally, the point nearly reaching skirt hems. The advent of another new silhouette in the 1840s, when wide crinolines made the triangular styles impractical, meant another evolution in the history of Paisley shawls. New cloths, typically 11′ by 5’6″–called Paisley plaids, though they were not plaid in design in the modern sense; the term referred to the rectangular shape–were folded and draped to create an outergarment that could be worn over these gowns. Though the Paisley shawl managed to adapt to several decades of changing fashion, it was the arrival of the bustle that made further adaptation untenable. The cherished shawls of the previous century migrated to trunks and chests, awaiting a revival that never came. The collapse of the shawl as a required accessory hit the city hard. This, coupled with economic crises and labor unrest, meant that the second quarter of the nineteenth century saw many mill closings. The exhibit tracks the history of workers in the city, including landmark labor actions in response to the changing economy. Paisley is a fascinating place. Other sites in the city to flesh out the story include the Sma Shot Cottages, the Thread Mill Museum, and the Dooslan Stane or Stone (a meeting place of the Weavers Union in the South of Paisley). Needless to say, I’m eager to go back — and to check out other stops on the Scottish Textile Trail. Next up in our series of posts from students in the first-year seminar “From Cotton to Kevlar” is one from Kate Grynkiewicz. Like many students in the course, she enrolled on a whim, but came away with some surprising insights. We’re so glad her last-minute addition of the course worked out so well! Walking into this new freshman seminar on the first week of classes, I wasn’t sure what to expect. To be honest, I took this class mostly because I wanted that one extra credit it offered. I was stressed out that I would be behind on my credits before I even started college. I have always been interested in fashion, and history was never the boring, tedious class it was for so many of my friends. What I got out of this class was more than I ever expected. For a class that only meets once a week, Marla and Jon bombarded us with a whirlwind of information every passing week. As one would anticipate from a fashion history class, I learned tons about how fashion has changed throughout the ages, and how these changes impacted the world. One of my favorite lessons was Marla’s lecture on the evolution of the woman’s silhouette. From huge hoop skirts, to the scandalous flapper, to the feminine 1950’s housewife, we covered it all. It broadened my knowledge of fashion history and strengthened my passion for it as well. What I did not expect from this class was the amount of new technology I would be exposed to and encouraged to try out throughout the semester. This was the part of the class I spent the most time playing around with. I won’t lie, at first I was a bit annoyed with the amount of time it took to become well versed with interactive online tools, such as Timeline JS and WordPress. But, in my opinion, the end results were well worth it. I am proud of the work I put into creating the two timelines I made over the semester, as well as the web page I built with my group on the history of fashion news. While I am still certainly a newbie to constructing online web exhibits, Jon and Marla structured the class in a way that forced me to step out of my comfort zone and experiment with new technology. Yes, it was frustrating at times. But I walked away from the class with a tool belt of useful skills I’m sure I will apply to a variety of different areas of study throughout college. While I am not a history major, any history classes I take in the future I will try to take with Jon or Marla. They both made sure they were readily available for any questions we had, and trust me, I had lots of questions when my group was finishing up the online web exhibit. Overall, I took away much more than I imagined I would when I enrolled for this class the night before classes started. It was insightful, it was fun, and above all it gave me skills I will use for the rest of my life. First – I can honestly say as the weeks progressed in my “Historic Dress Meets Digital Humanities” class, I grew deeper and deeper into the subject matter. Whether it was taking a closer look at the science of fabrics or achieving a new perspective on a woman’s wardrobe in the Civil Rights Movement, the lessons never ceased to amaze me. Once we were assigned into our final group projects and I was put into “Fashion News,” it was safe to assume that picking an even more specific subject would be a little overwhelming. My group and I were late on coming up with the topic, swimming in apprehension on the possible choices. With Thanksgiving break coming in at full speed, we knew that finishing the project beforehand was definitely a priority. We eventually got past our “humming” and “hawing”, deciding that the external aesthetics of a given piece of fashion news is essential and has definitely evolved into something completely different from a century ago. There is a lot riding on a magazine cover, believe it or not – everything from the pictures to the text. It can make or break the audience’s attention. Starting over two centuries back in time, Ackermann’s Repository was the first magazine we focused on and my personal portion of the project. After researching Ackermann’s and getting my hands on an actual archival piece from the Du Bois library, I was very fascinated with the absence of clothing on the cover. However, the inside of these magazines were incredibly elaborate with detailed drawings of women in full dress along with real, embroidered fabrics in each issue. Ackermann focused on many aspects of society i.e. 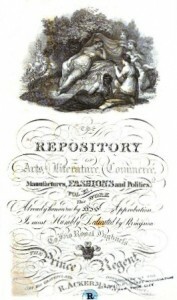 art, literature, commerce, manufacturers, politics, along with fashion. Ackermann’s Repository‘s lack of external layout calls for the theme of “don’t judge a book by its cover.” Despite its long and intimidating front pages, Ackermann’s held a lot of interesting information that would be hard to find in a fashion-related magazine today. Fast-forwarding to 2013, magazines are slowly and steadily becoming an “out” source, and television is ruling the competition. 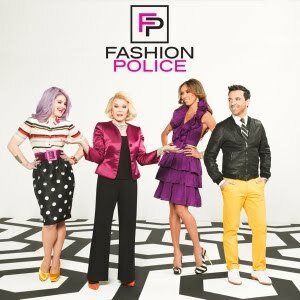 Shows like “What Not to Wear” and “Fashion Police” are ultimately what people want to see: a harsh critique by notoriously famous celebrities, i.e. Joan Rivers and Khloe Kardashian. We ultimately learned that the transition from a subtle, classy, and simple execution of fashion advice to ridiculous projections of what’s right and wrong is definitely the real deal these days. Regarding the tech-based aspects of our project, this was our main concern. We were confident about our info but intimidated by the detailed layout of WordPress. Not one of us had worked with this tool before so challenge was an understatement. All the codes, HTMLs, miscellaneous letters, and “<”s were a foreign language. My group-mates and I spent hours at the library – cutting, pasting, font-ing, and layout-ing. In retrospect, I’m glad I learned the logistics of WordPress and I’m almost sure it will benefit me in the upcoming years. We were anxious to see other exhibits and many questions along the way, but the ending result was rewarding. We finished on our deadline and I can honestly say it was one of the most collaborative groups I’ve ever been in. Everyone’s exhibits were intriguing and I am happy to say this class was an awesome experience. With the semester coming to a close, we’re pleased to introduce a series of guest posts from students in the course Cotton to Kevlar. Thanks to first-year student Andrea Moore for launching these reports from the class! When I was creating my first ever schedule for UMass Amherst during the summer orientation, I decided to take a one credit seminar. The seminar was the Cotton to Kevlar seminar. I couldn’t tell you what my exact reasons for taking this seminar was–it’s been months since I made that decision–but I was curious as to how exactly fashion had changed throughout the years and what relation that had to the corresponding historical events. I’m also fairly certain that I wanted another credit for the Fall semester but that’s beside the point. The first class of the semester started with the usual introduction to the class and the sharing of names. Kiki Smith from Smith College came to show a sample of clothes from the Historic Clothing Collection located at Smith. While I don’t remember every article of clothing looked like, what struck me the most was the dresses from the ‘60’s. I’ve heard the expression that trends come in and out of fashion over and over again but I don’t think I really understood how that could happen until I saw the dresses and realized that they looked like something I could wear today and my style would not be considered “retro”. I left that class with a strong desire to try on the dresses. From then on, the seminar became a little break in the week. Because we met only once a week, the workload was much less than most of my classes. The low workload, the 50 minutes in class a week, and the fact that I took this class purely out of interest let me have more fun in the class and not stress too much over the work like I did in my other classes. This is not to say that work didn’t stress me at all, oh no. The most stressful assignment was due on October 28. For this one, we had to browse several different online websites for photos of clothes from the 1890’s to the 1950’s. 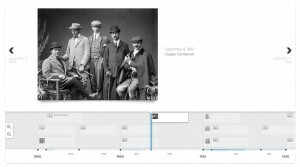 The we had to assemble 30 images into a timeline using the Timeline.js program (http://timeline.knightlab.com/). I liked the browsing for photos but that website really frustrated me. Organizing the photos in a Microsoft Excel-like spreadsheet, uploading it, and then realizing that the photos didn’t show up added many more hours of technical difficulties than I would have liked. In the end, however, I finally got everything to my liking but it was not without some hard work. After the Timeline assignment most of the work was not as time consuming until it came time to create our final project, the online exhibit. The exhibit required research and information that I had a hard time finding. Eventually I found what I needed began the process of adding it all to a Word Press blog post, which took a few days, and then edited it. One of the last things I did with my group for the exhibit was provide links on our homepage to specific articles and add navigation bars at the bottom of each post. This was honestly the part I liked the most about the exhibit as I got to do a bit of not-too-difficult problem solving. While there were some harder projects, this class, for the most part, was fun, easy and let me explore a little part of a subject I had some interest in. To anyone thinking about taking this class, be prepared for a few dense technology readings, a quick look at different fashions and styles from American history and an overall enjoyable course.